The purpose of the Cypress Creek Watershed Plan is to identify key issues affecting water quality and quantity and develop appropriate strategies for protecting and enhancing these resources, even as development occurs. The Plan will serve as a model for Franklin County to use in planning for the stewardship of all of its watersheds. 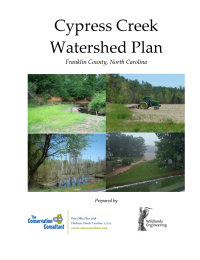 The Cypress Creek Watershed Plan is designed to serve as a guidebook for landowners, Franklin County, state agencies, conservation groups, and citizens interested in taking concrete steps to enhance the long-term health of the Cypress Creek watershed. A major portion of the plan is devoted to specific watershed management recommendations to reduce existing impacts and prevent future impacts to surface and groundwater in the watershed. It also includes a summary of findings on existing physical conditions and regulatory restrictions in the watershed, and a summary of the input of agency representatives, landowners, and private citizens, solicited through Citizens Participation Workshops, Advisory Committee meetings, and interviews. The Plan provides, for the first time, a comprehensive geographic information system (GIS) database of computer map information dedicated to the watershed and available for planning, conservation and restoration.